Ever notice how your shopping behaviors change depending on who you’re shopping with? I certainly have. I noticed this most thoroughly on three recent grocery shopping trips, which I’ll relate. My first shopping trip was entirely by myself. I went with a shopping list in hand, which I almost always do, and I stuck pretty strictly to it. My only splurging, if there was any, was on specific items – I bought free-range eggs and organic milk, like I usually do. I only made one real impulsive buy, which was buying some organic steel-cut oatmeal. My second trip was with just my wife and I, when we decided to go shopping before picking up the kids one afternoon. We shopped with a list again, but with just the two of us, we wound up with several unintended items in the cart at the checkout: salad dressing, a loaf of Italian bread from the bakery, a smoothie, and a pint of ice cream were among the items (and I believe there were one or two more). My third trip was with just myself and my two kids. This time, I stuck 100% to the list. The only diversion that occurred at all on this trip was that I had an item on the list that said “snack” and I let our son pick a type of cracker to get – we wound up getting Triscuits, which he loves. What did I learn from these three trips? My two children are my best shopping chaperones. When they’re along and I’m under their watchful eyes (and they are watchful – they pay careful attention to what I do), I tend to be very careful to follow the list. When I’m by myself, on the other hand, I just focus on the list and don’t have time for distracting conversation or anything like that. With my wife, however, we often get engrossed in conversation during the trip and decide together on impulsive items. What’s the point of this observation? Shopping habits are often influenced by the people you shop with. This just happens to be a great example of this effect, but it’s something I often noticed during my life. If I shop with certain people, I tend to spend more than if I shop with other people. If you want to cut your shopping expenses, having a list is one useful step, but having a strong chaperone that controls your frivolous tendencies can also be useful. Here are some useful tactics that fall in line with this strategy. Master shopping alone with a list. Give it a sincere shot. Every time you go into a store for the next month, have a list with you and only buy things on that list. If it’s not on your list, don’t buy it, period. Mastering this skill makes it much, much easier to get in and out of a store without succumbing to the desire to buy impulsively. Identify those friends that encourage you to spend more – and those that encourage you to spend less. For example, I have one friend who almost always subtly convinces me to spend money on electronics and video games. For some reason, we often tend to wind up in electronics stores, and it’s with him that I’ve purchased several items that I simply don’t need. On the other hand, another of my closest friends basically doesn’t spend anything at all. Whenever I happen to be in a shopping situation with him, he gives almost a negative vibe towards spending – and that’s a good thing. It discourages my tendencies to spend. Avoid situations where you’re in tempting places with friends that encourage your spending tendencies. To put it simply, I should make a special effort to avoid electronics stores when with my gadget-loving friend. If I sense that I’m about to be in such a situation with him, I should have my guard up very high – or I should try to divert us into a different activity. Similarly, window-shop with a “chaperone” that encourages your frugal side. On the other hand, when I’m doing comparison shopping, my frugal friend is a good one to have along. He subtly discourages bad buying tendencies and helps me keep my focus on the things I actually need instead of frivolous and short-lived material desires. 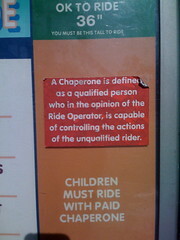 The word “chaperone” is a loaded one. It might make you think of a high school dance or of treating yourself like a child. I think of it more in the sense of curbing your poor tendencies. A shopping chaperone can really help you save money. Give it a try.